Socializing and exchanging ideas among students is a crucial component of university campus life. Now, TAU’s Student City has gained an exciting and vibrant new student club that will act as a social hub for the busy dormitory complex, which houses 1,700. The Stanley and Joyce Black Family Foundation Student Club at Student City was established by the Black family of California, longtime supporters of TAU. The Club was officially dedicated in the presence of close family members and friends, including Stanley Black and Joan Ashton, Jill Black Zalben and Marvin Caesar, Janis Black Warner and Doug Warner, and senior TAU officials. The Club demonstrates the dedication of the Black family both to the development of TAU and the wellbeing of its students. For over 40 years, the family has supported important medical research, including that of Prof. (emer.) 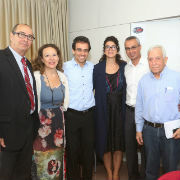 Sara Lavi of the George S. Wise Faculty of Life Sciences and Prof. Yossi Shiloh of the Sackler Faculty of Medicine, as well as the work of Prof. Hana Wirth-Nesher, founding Director and Head of the Goldreich Family Institute for Yiddish Language, Literature, and Culture at TAU, among other projects. Beverly Hills real estate magnate and philanthropist Stanley Black founded the Black Equities Group in 1985 along with his son, Jack. Stanley’s daughters, Jill Black Zalben and Janis Black Warner, are Directors of the Stanley and Joyce Black Family Foundation. 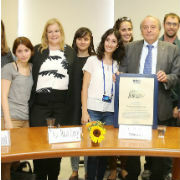 TAU President Joseph Klafter described the Student Club as a “the fulfillment of a dream for Student City and tremendously important for the University.” Stanley Black responded firmly, “I believe it’s important to help Israel and TAU is important for Israel’s future. We are glad to be able to help”. At the ceremony, Prof. Klafter presented Mr. Black with a President’s Circle pin reserved only for the University's most generous donors.